At age 25, Kyrie Boyle looked in the mirror and saw an introverted secretary who hated her job. “I had accomplished almost nothing with my life and had not come anywhere close to achieving my dreams,” said the Virginia Beach native, who attended numerous high schools in the city before earning her GED. These days she will talk your ear off about authors ranging from William Shakespeare to Christopher Marlowe to Deborah Harkness. 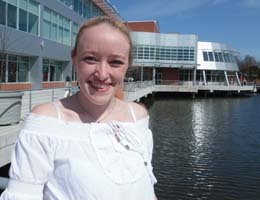 She will graduate from Tidewater Community College on May 16 with her Associate of Arts in Liberal Arts and transfer to Old Dominion University in the fall to major in literature and creative writing. Boyle will be the first in her family to finish college. To call her early years challenging is an understatement. Problems with her parents forced her into foster care, and she ran away from that, surviving on her own with the help of friends’ families. She married at 20, divorced at 21, battled alcohol and marijuana use. An online for-profit school scammed her out of money. Undiagnosed thyroid problems prevented her from holding down a job for too long. When her brothers George and Geoffrey started at TCC, Boyle saw it as a sign. Though Boyle enjoyed learning most of her life, she had never applied herself until arriving at TCC. Initially, assimilating into college life was difficult, as she spoke to almost no one on campus, aside from her instructors, for her first two semesters. A biology lab class introduced her to a fellow student who became her best friend. Then a pizza social piqued her interest in the Student Government Association. She became a senator who was active and outspoken on committees. Currently, she is president pro tem on the Virginia Beach Campus, allowing her to participate in regular meetings with Provost Michael Summers. Boyle talks passionately about following in the path of her great grandfather, an English professor at Louisiana State University. Like him, she plans to earn a doctorate in English, hoping to teach 15th, 16th and 17th century literature. She’s made a promise to herself that she will spend at least one semester at Oxford University, studying in the historic Bodleian Library. “I dreamed of walking the halls of the Bodleian Library since I was 6 years old,” she said. But first she will walk in her first graduation with a host of supporters in the audience at the Ted Constant Convocation Center.